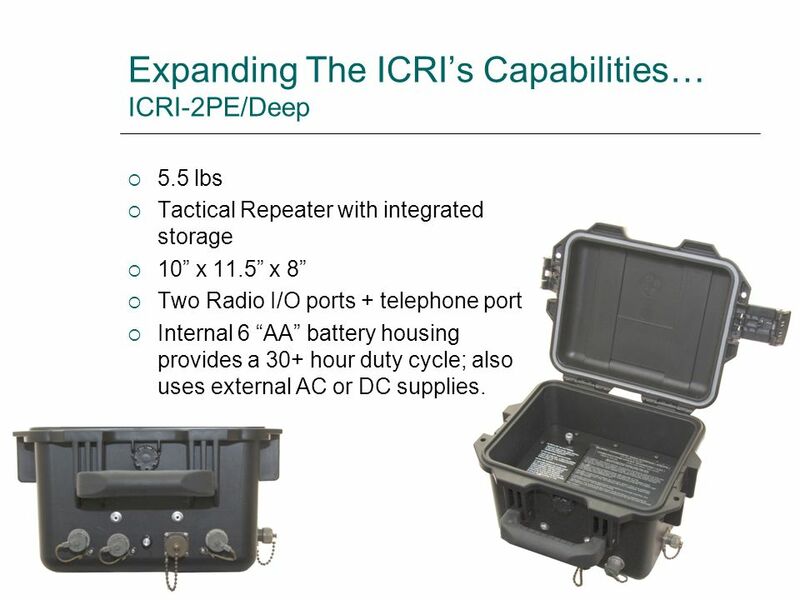 5.5 lbs Tactical Repeater with integrated storage 10” x 11.5” x 8” Two Radio I/O ports + telephone port Internal 6 “AA” battery housing provides a 30+ hour duty cycle; also uses external AC or DC supplies. 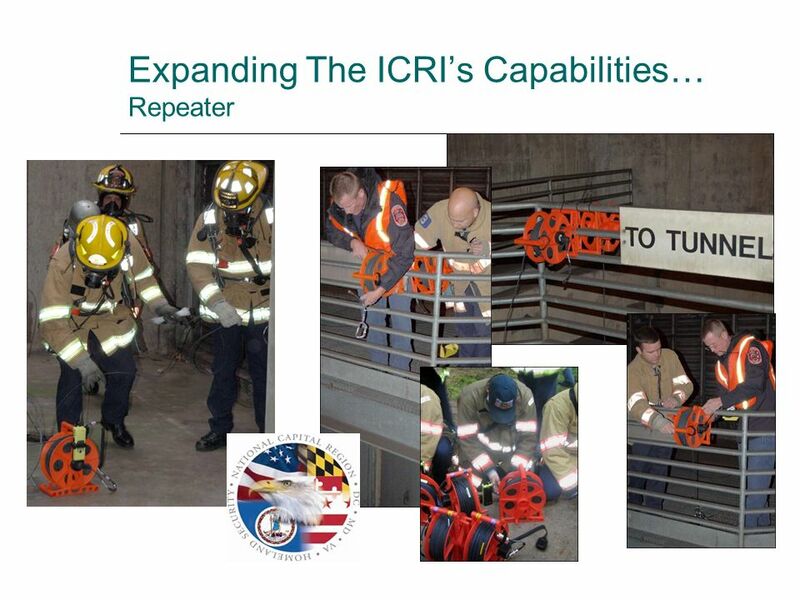 Provide seamless interoperability between emergency services communications networks, including agency two-way radios, with satellite-based extensions to public or private networks. 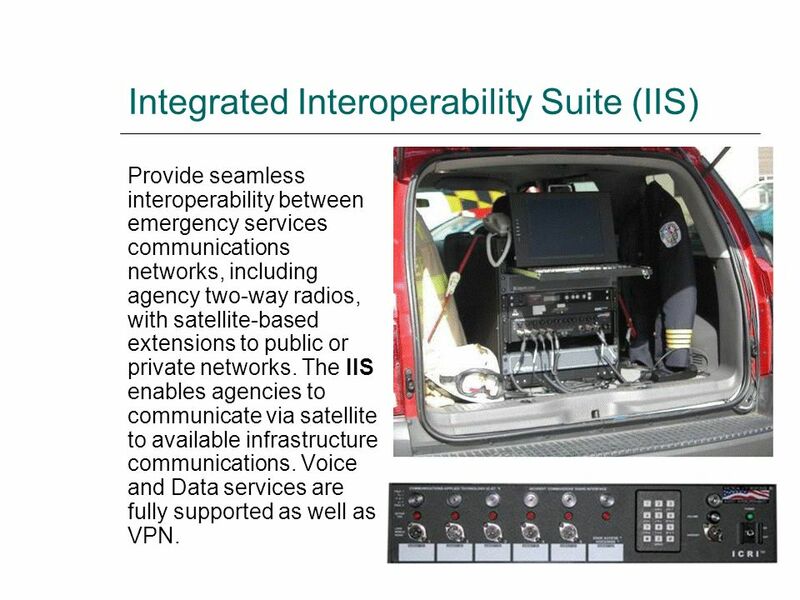 The IIS enables agencies to communicate via satellite to available infrastructure communications. 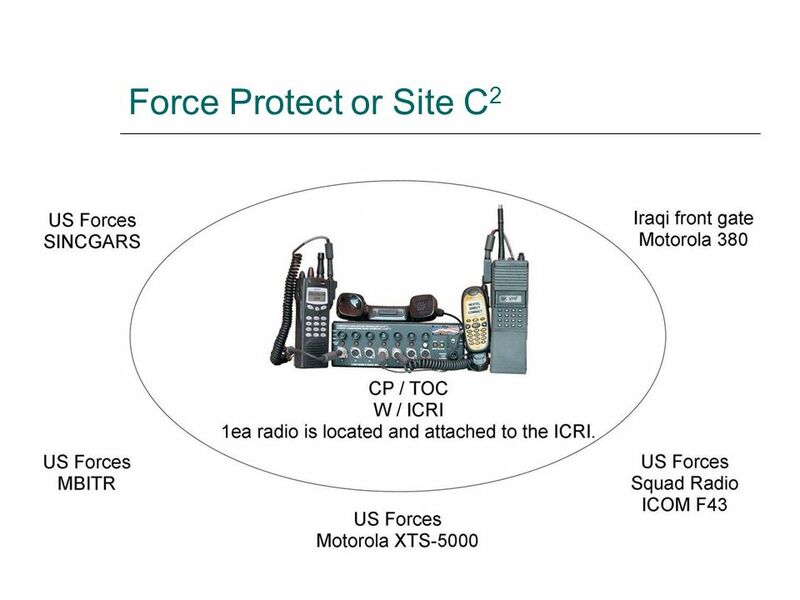 Voice and Data services are fully supported as well as VPN. 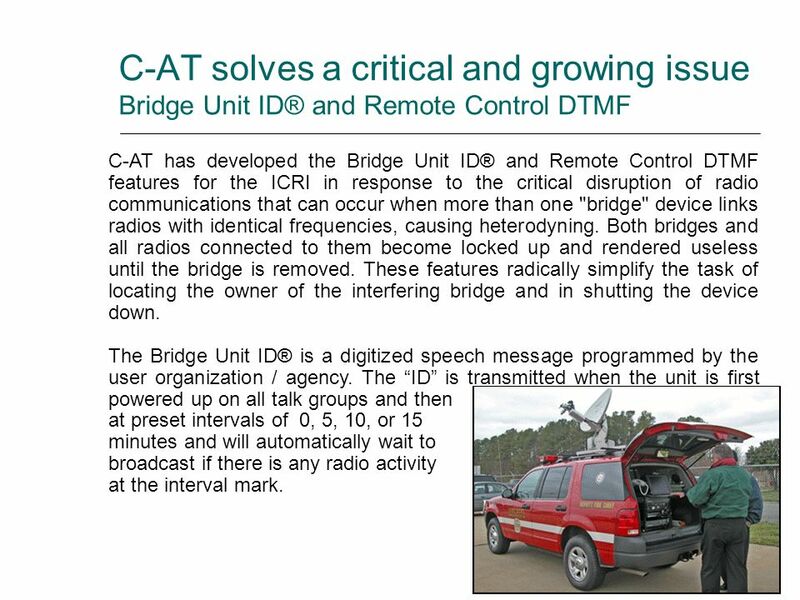 C-AT has developed the Bridge Unit ID® and Remote Control DTMF features for the ICRI in response to the critical disruption of radio communications that can occur when more than one "bridge" device links radios with identical frequencies, causing heterodyning. 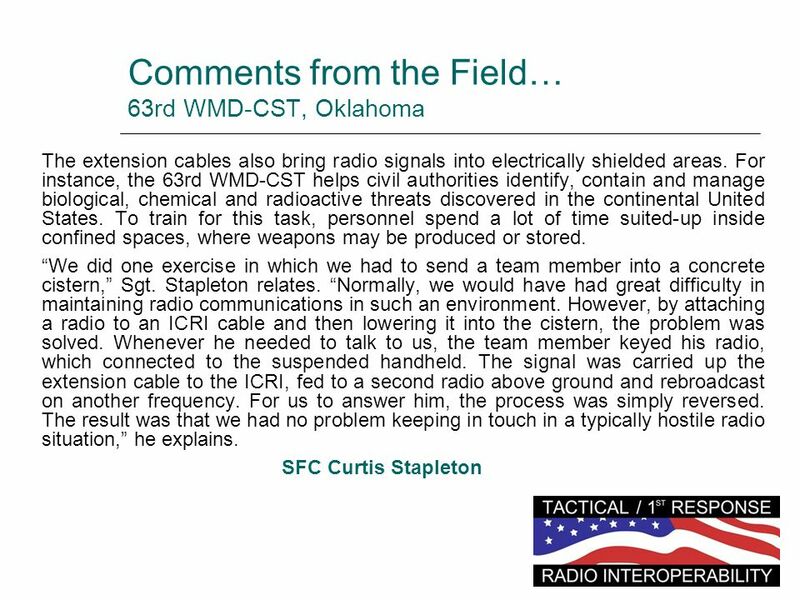 Both bridges and all radios connected to them become locked up and rendered useless until the bridge is removed. 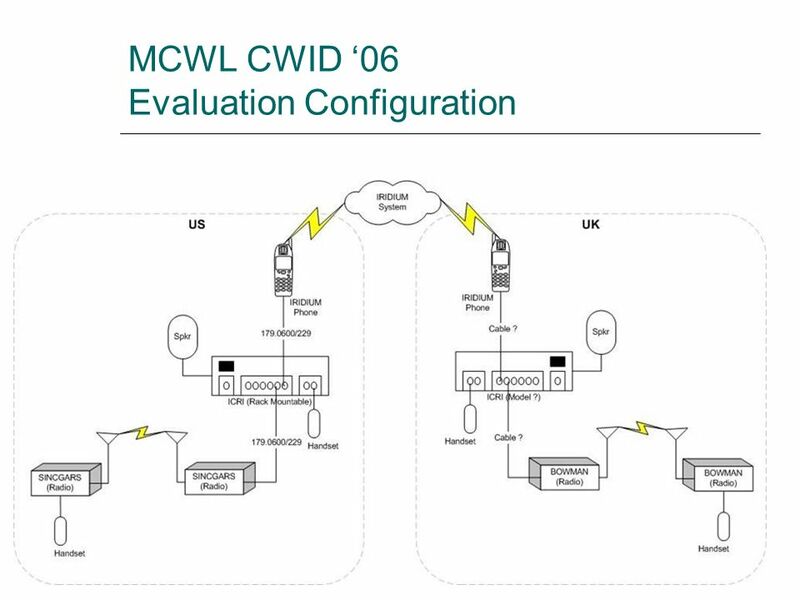 These features radically simplify the task of locating the owner of the interfering bridge and in shutting the device down. 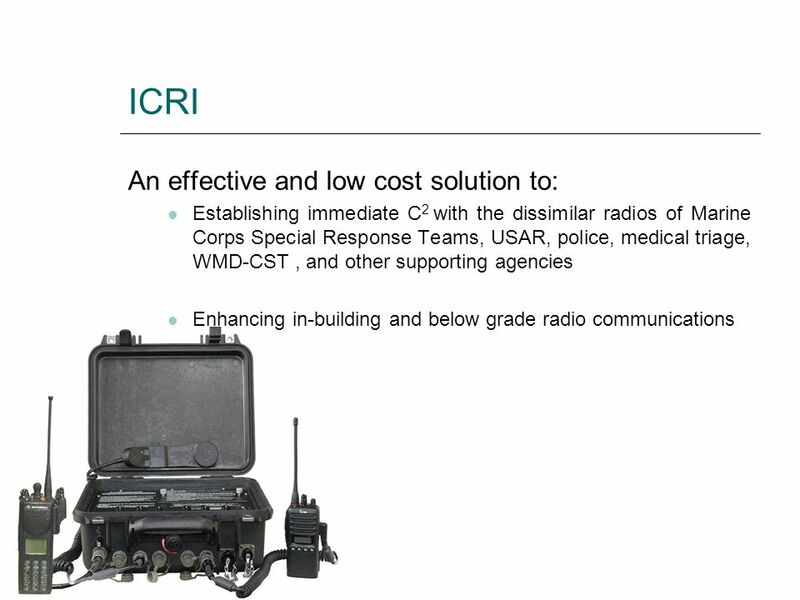 The Bridge Unit ID® is a digitized speech message programmed by the user organization / agency. 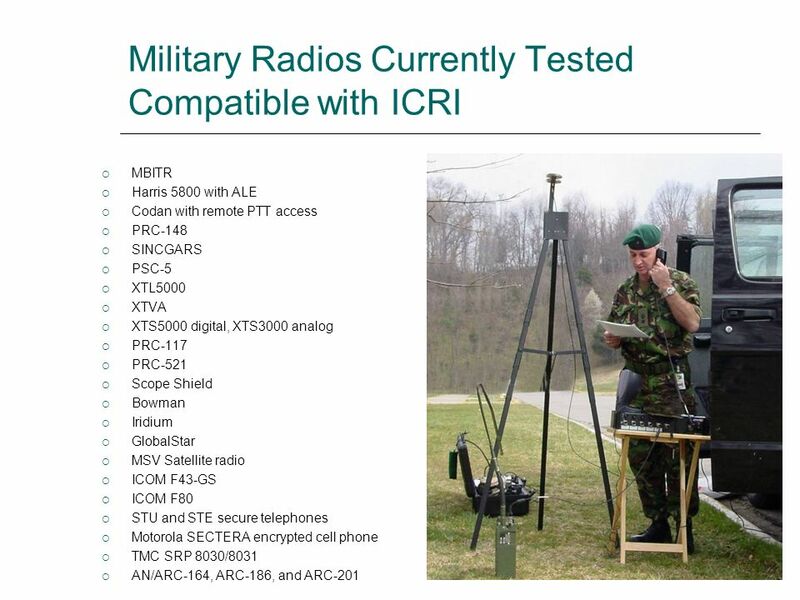 The “ID” is transmitted when the unit is first powered up on all talk groups and then at preset intervals of 0, 5, 10, or 15 minutes and will automatically wait to broadcast if there is any radio activity at the interval mark. 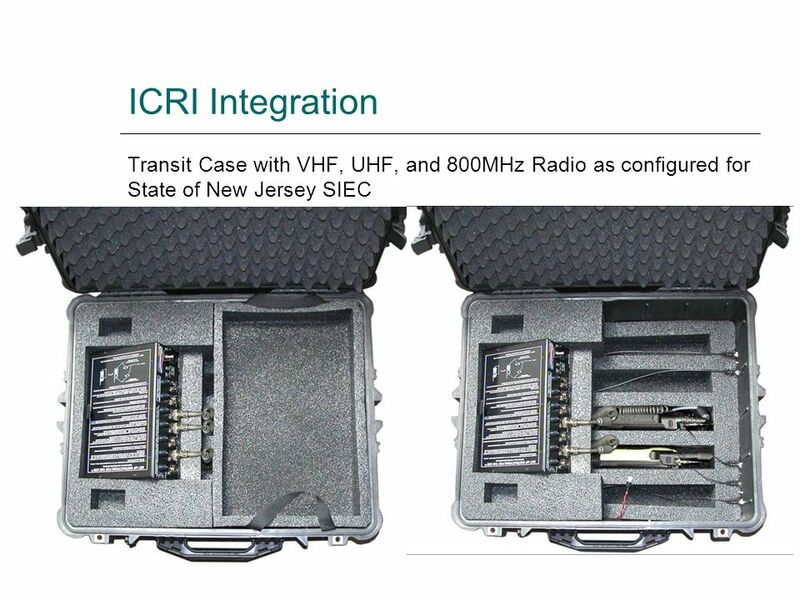 22 Additional Details1 A small, lightweight interconnect assembly for dissimilar radios (models/frequencies, clear/encrypted, talk-around/ trunked) used by the multiple organizations/teams at an IDLH incident. 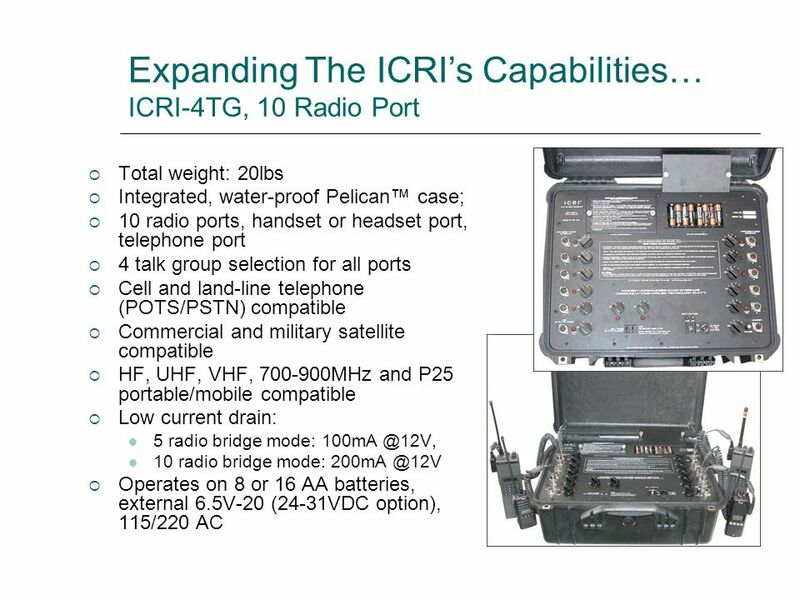 A rugged assembly that can be transported to an incident without special transport or power requirements. 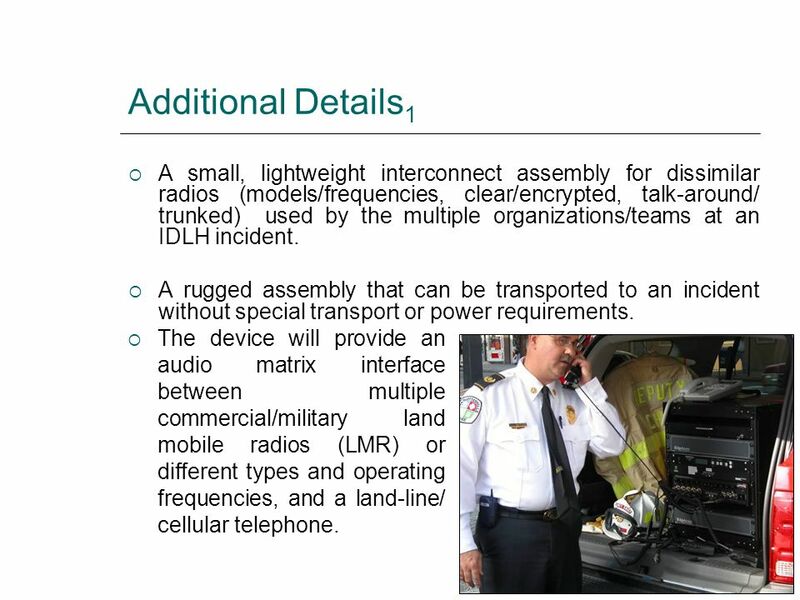 The device will provide an audio matrix interface between multiple commercial/military land mobile radios (LMR) or different types and operating frequencies, and a land-line/ cellular telephone. 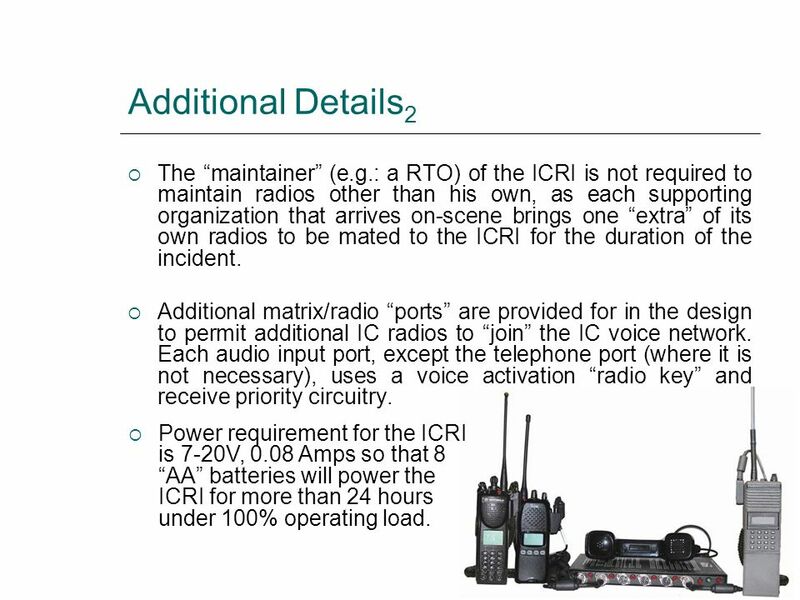 23 Additional Details2 The “maintainer” (e.g. 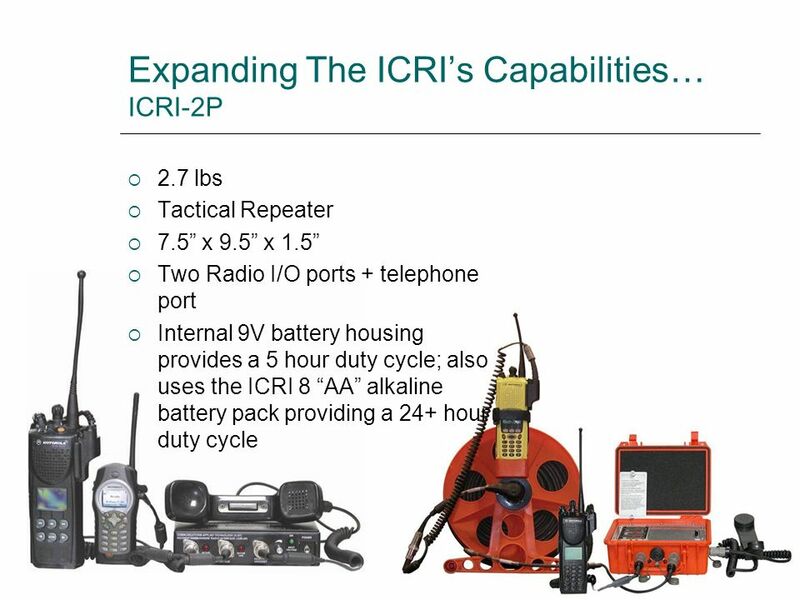 : a RTO) of the ICRI is not required to maintain radios other than his own, as each supporting organization that arrives on-scene brings one “extra” of its own radios to be mated to the ICRI for the duration of the incident. 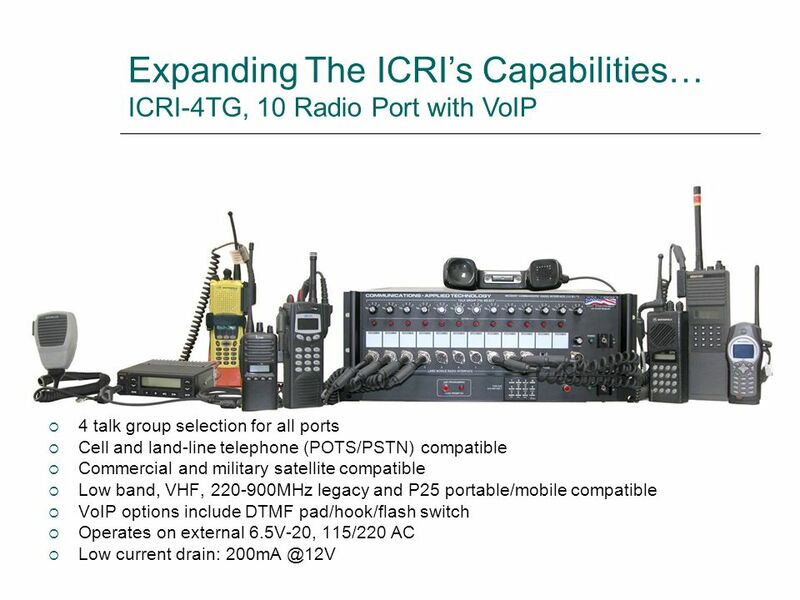 Additional matrix/radio “ports” are provided for in the design to permit additional IC radios to “join” the IC voice network. 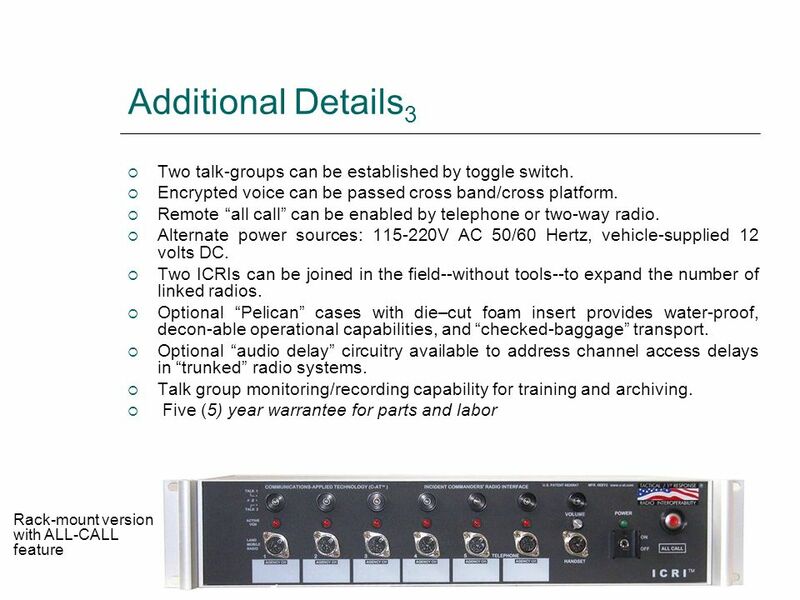 Each audio input port, except the telephone port (where it is not necessary), uses a voice activation “radio key” and receive priority circuitry. 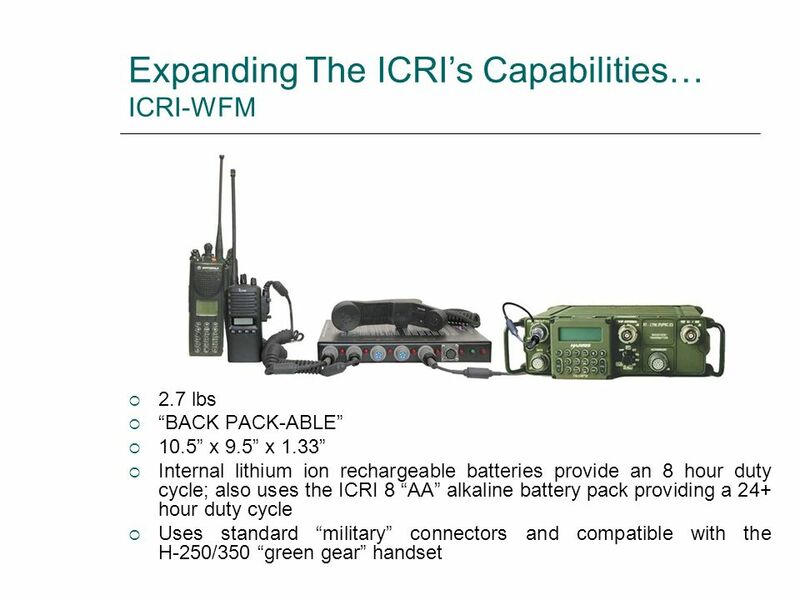 Power requirement for the ICRI is 7-20V, 0.08 Amps so that 8 “AA” batteries will power the ICRI for more than 24 hours under 100% operating load. 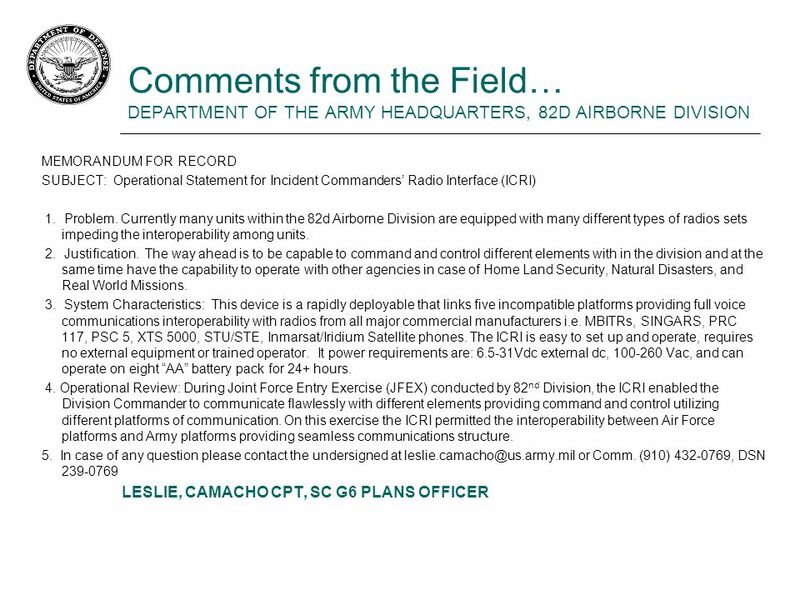 Operational and performance capabilities summary. 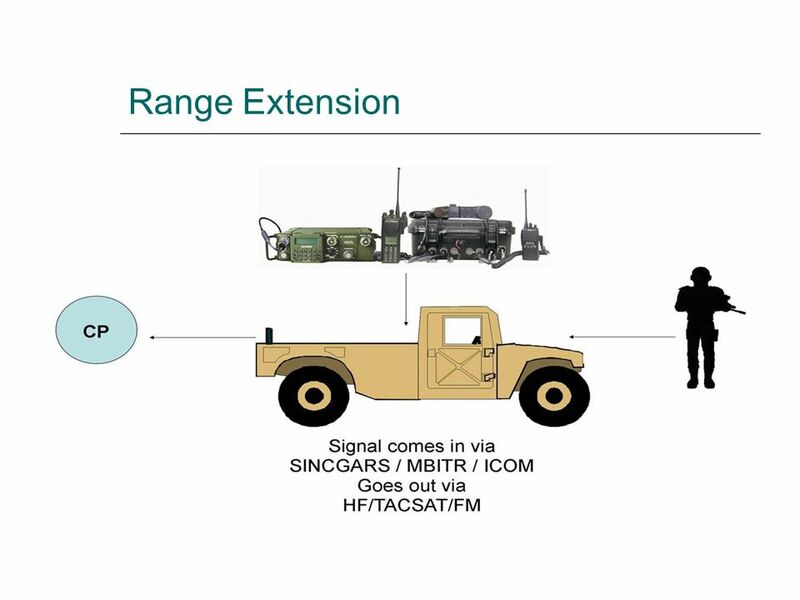 A rapidly deployable device to link 2 to 11 incompatible communications devices providing full voice communications interoperability in the field--Remote DTMF controllable over the air or IP . 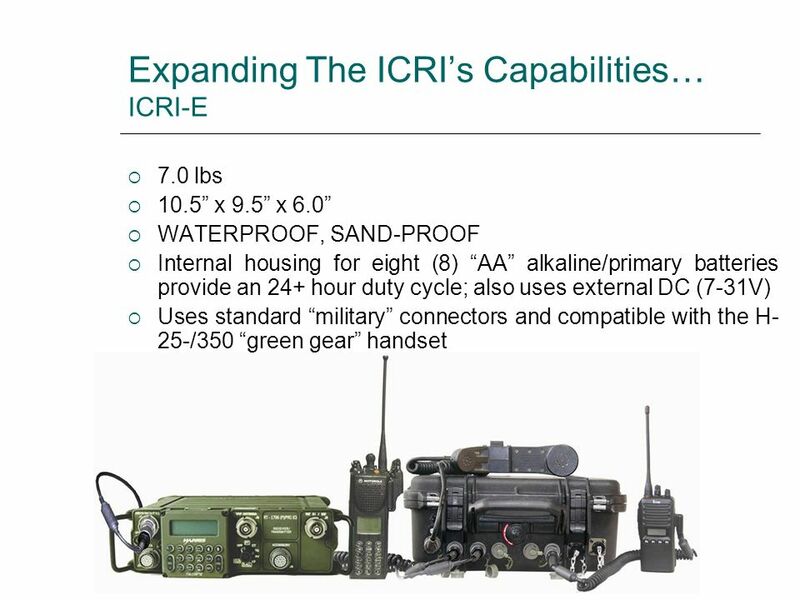 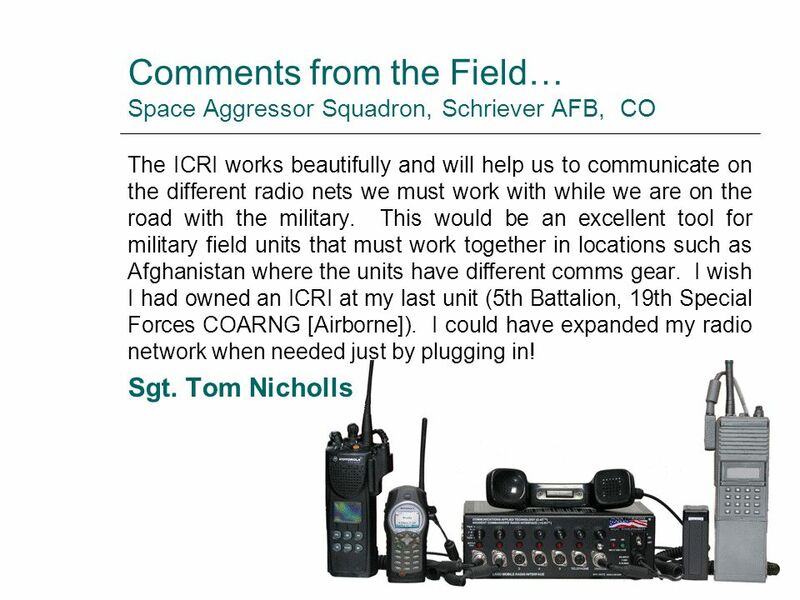 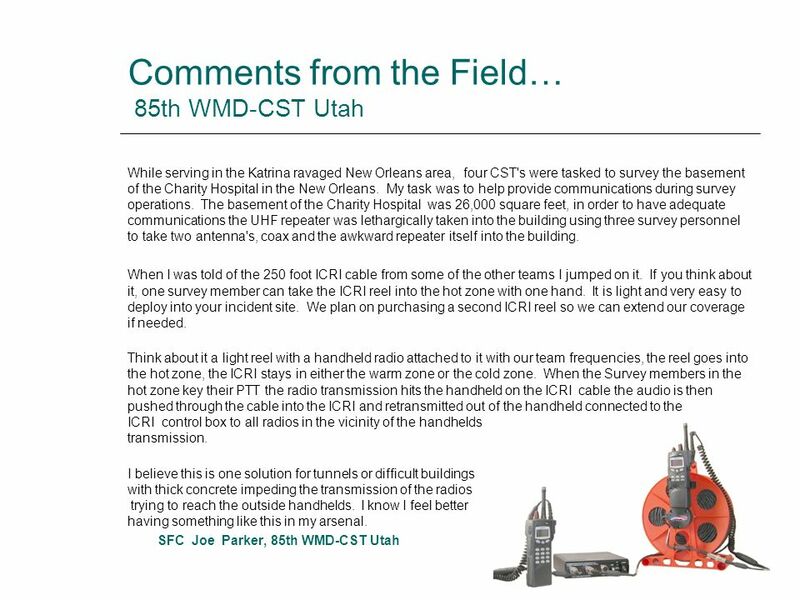 Supports interoperability of HF/VHF/UHF, MHz simplex and trunked commercial radios, “green gear” radios (including MBITR, SINCGARS, PRC117, PRC150 PSC5, XTS5000, XTL5000, XTVA), STU/STE phones Global-Star/Inmarsat/Iridium satellite telephones, Nextel “direct connect” radiophones Radios, telephone and handset can be individually assigned to up to four (4) communications networks/talk groups based on NIMS or encryption level Supports VoIP phone, cell phones and land-line phones Simple and easy to set up and operate, no external equipment or trained operator required; no Windows or other OS interface for direct interoperability Small, rugged, lightweight and highly portable Total weight: versions as low as 7.0 lbs 10.5” x 9.5” x 6.0” Operates with “AA” batteries (30 hr [shorter with VoIP enabled]), DC, or AC Uses standard “NATO” connectors and compatible with the H-25-/350 “green gear” handset Portable, tactical interoperability between LOS:LOS and LOS:BLOS voice communications equipment directly and in combination with VoIP Permits encrypted communications devices with different “keys” to intercommunicate directly or through secure VoIP Permits cross-band/cross platform radio interoperability between military and public safety radios directly or through secure VoIP Rough Order of Magnitude Cost and Schedule: The ICRI is a COTS/NDI item and is currently available on GSA contract No. 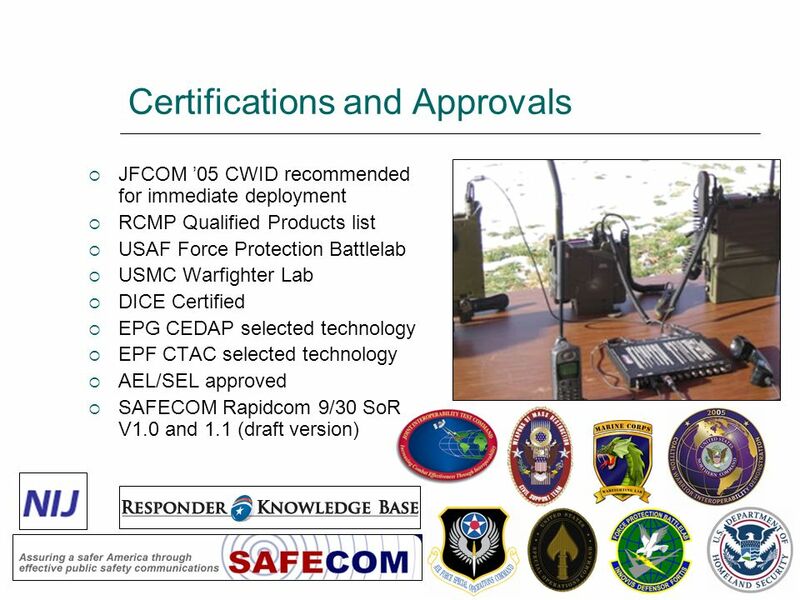 GS-07-F-0653N. 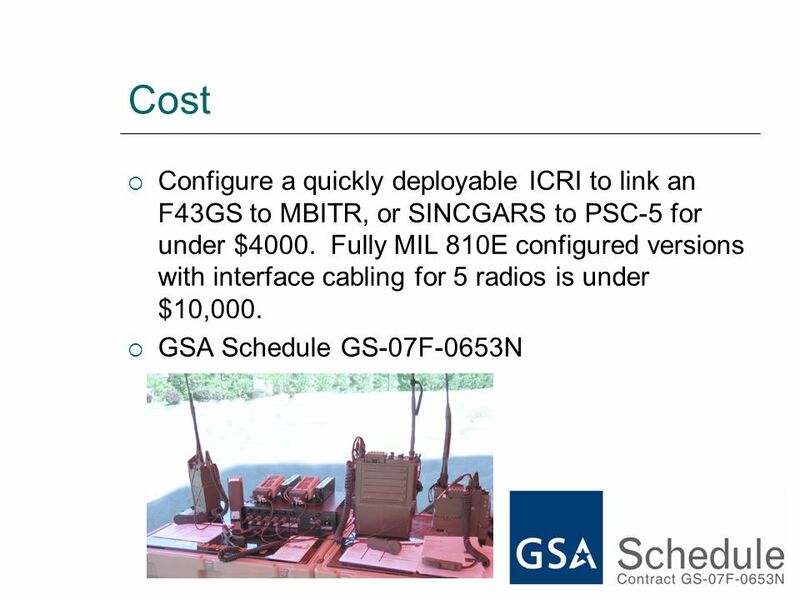 Shipset configurations recently purchased by military agencies have an invoiced value of $10,000. 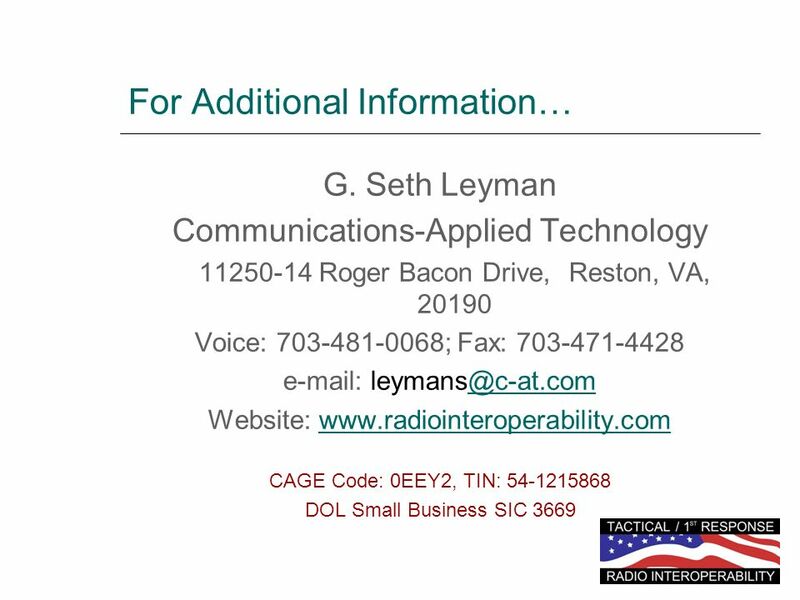 No annual calibration or depot level service required Availability of the ICRI is days after receipt of order Corporate Information: Communications-Applied Technology Roger Bacon Drive Reston, VA Tel: , Fax: , Mr. Seth Leyman, President. 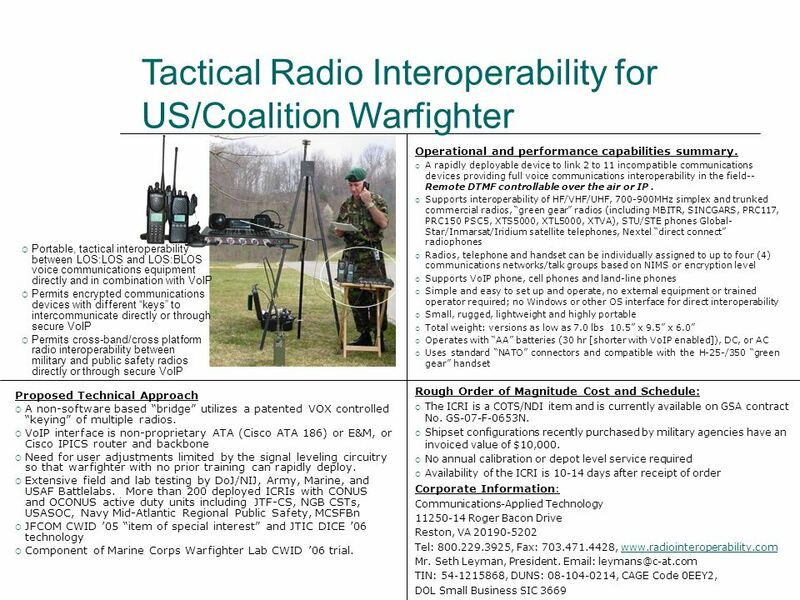 TIN: , DUNS: , CAGE Code 0EEY2, DOL Small Business SIC 3669 Proposed Technical Approach A non-software based “bridge” utilizes a patented VOX controlled “keying” of multiple radios. 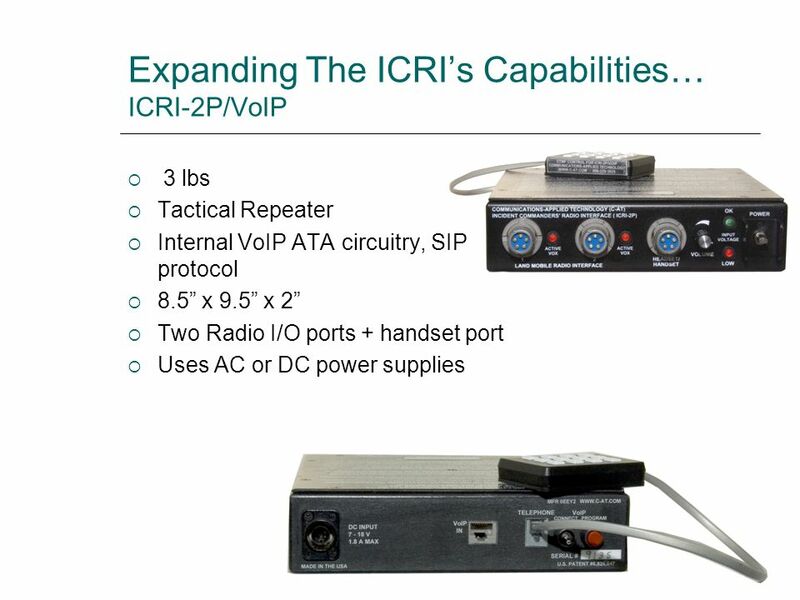 VoIP interface is non-proprietary ATA (Cisco ATA 186) or E&M, or Cisco IPICS router and backbone Need for user adjustments limited by the signal leveling circuitry so that warfighter with no prior training can rapidly deploy. 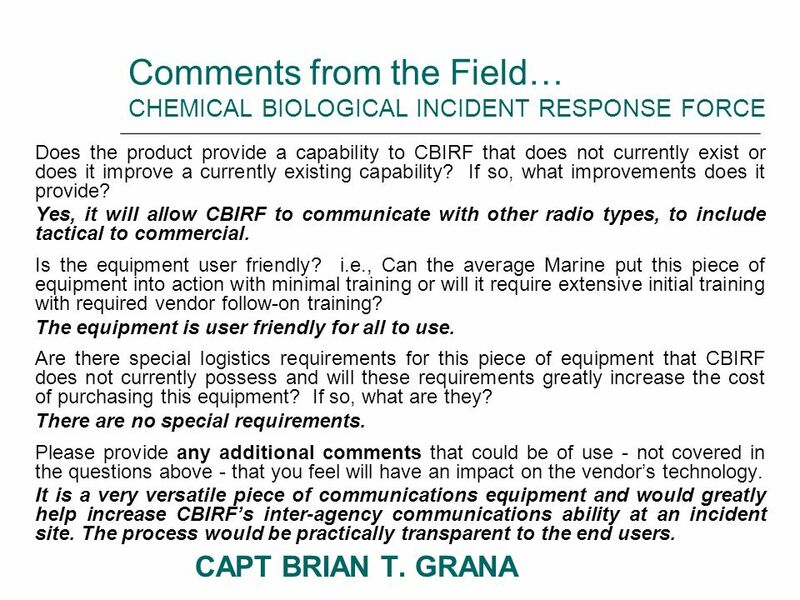 Extensive field and lab testing by DoJ/NIJ, Army, Marine, and USAF Battlelabs. 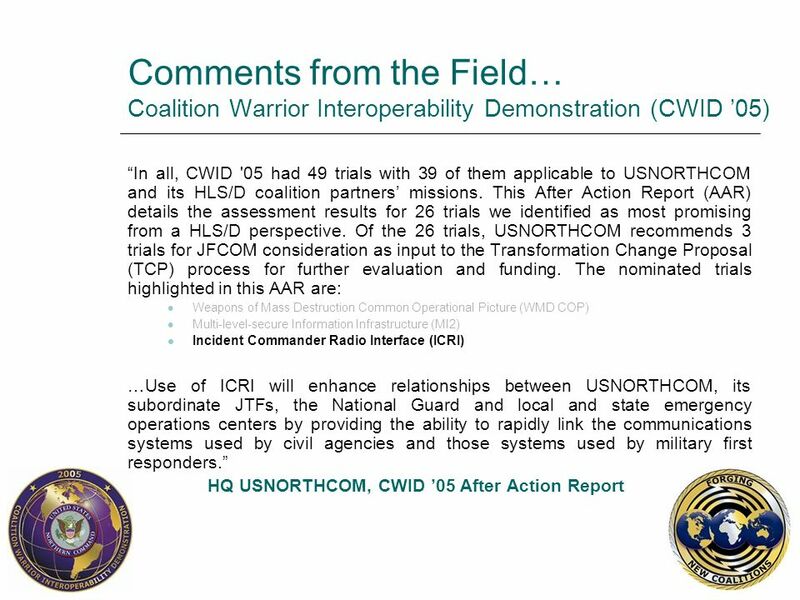 More than 200 deployed ICRIs with CONUS and OCONUS active duty units including JTF-CS, NGB CSTs, USASOC, Navy Mid-Atlantic Regional Public Safety, MCSFBn JFCOM CWID ’05 “item of special interest” and JTIC DICE ’06 technology Component of Marine Corps Warfighter Lab CWID ’06 trial. 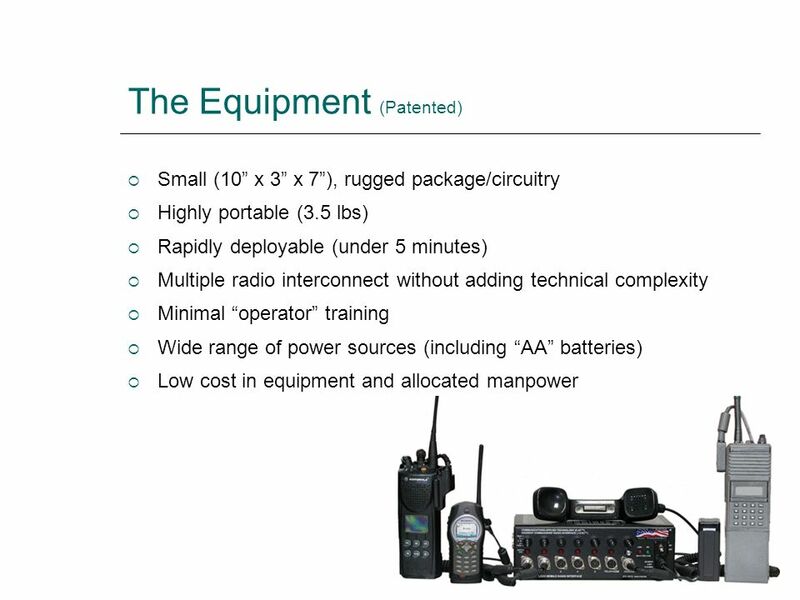 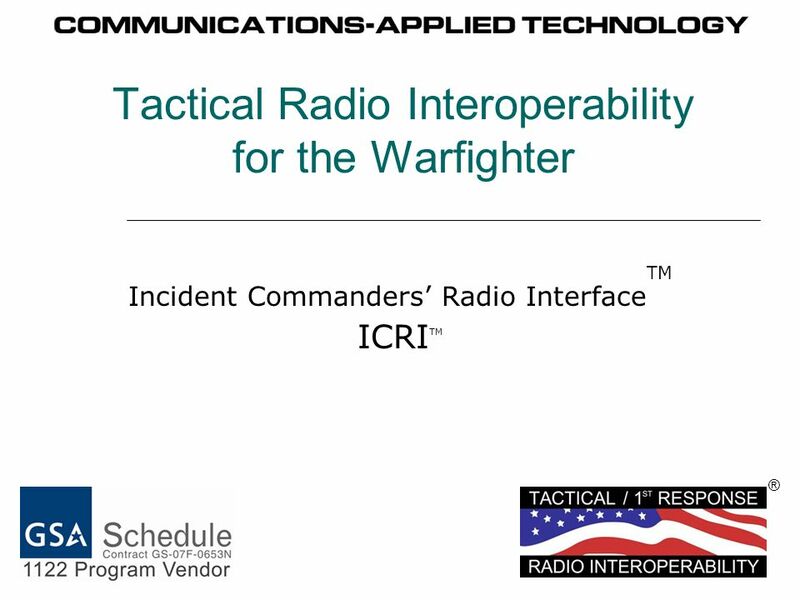 Download ppt "Tactical Radio Interoperability for the Warfighter"
Office of Emergency Communications Gateway Training Workshop Module One Basic Gateway Overview. 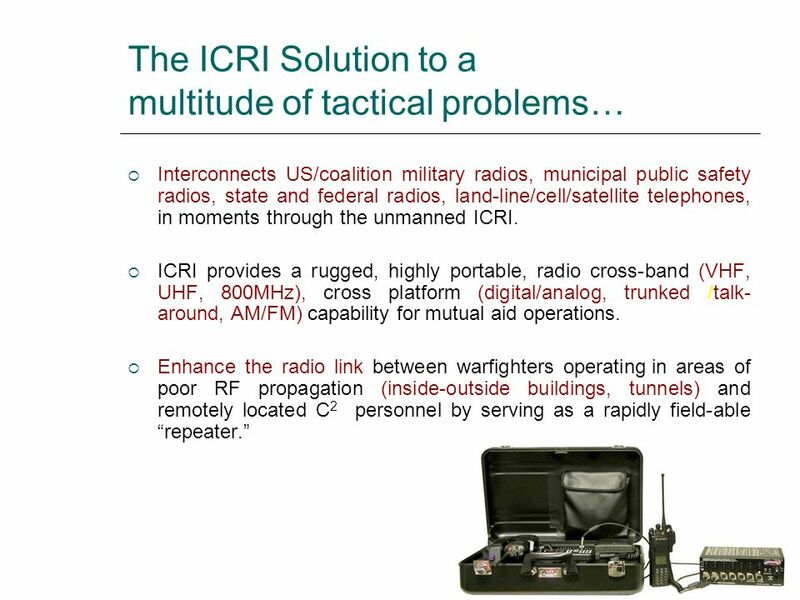 1 a company of Turkish Armed Forces Foundation Disaster Relief Systems, Network Resilience and Recovery İstanbul, Türkiye, 11 December 2012 How Can We. 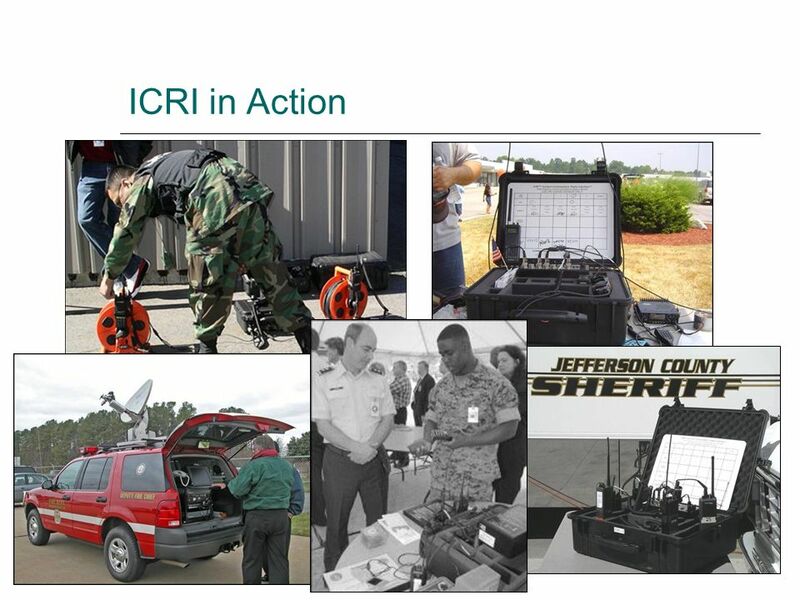 Technology Response to Hurricane Katrina and Rita Greg Tune, Lead Program Manager, Disaster Assessment/GIS.